The launch from Cape Canaveral will use a new Falcon 9 booster, and the company will attempt to land the rocket back on a landing pad after sending the Dragon spacecraft on its way to the ISS. The Dragon is also reusable and has been to the station once before, in 2017. 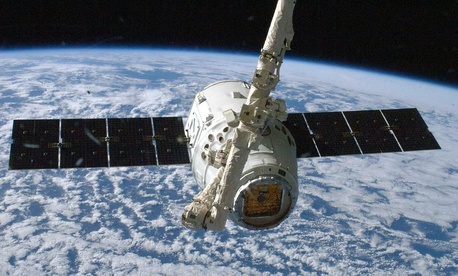 SpaceX’s reusable spacecraft have helped it offer better prices to NASA and other customers. The Dragon will carry 5,600 lbs (2,540 kg) of food, water, and experiments to the station. It will also bring a laser sensor, called the Global Ecosystem Dynamics Investigation, that NASA will use to measure plant biomass on Earth and track the affect of deforestation on climate change. Today’s launch comes after a new report that gas from company’s spacecraft may be contaminating research sensors outside the space station as materials in the spacecraft—likely its coat of paint—release chemicals due to the heat from the sun, which can reach 250°F (121°C) at the ISS. Still, the researchers using the sensor say it hasn’t affected their work. This is SpaceX’s 20th mission in 2018, which would beat the record the company set on Dec. 3 for most missions in a year by a private company. In 2018, SpaceX rockets will fly to orbit more often than any but those made by the Chinese government. SpaceX is hoping to fly more than just cargo to the International Space Station: Next year, Musk’s team is hoping to fly astronauts to the station, becoming the first private company to carry humans into orbit. Their first milestone is an uncrewed flight test scheduled for Jan. 17.